When West London Welcome clients come to staff asking for emergency support in a crisis, or when staff or volunteers become aware of clients facing a financial emergency, the West London Welcome Hardship Policy is consulted by the directors and a consensus about how much financial assistance can be offered is made. Once the value of the hardship payment is agreed upon, clients are given financial assistance straight away. 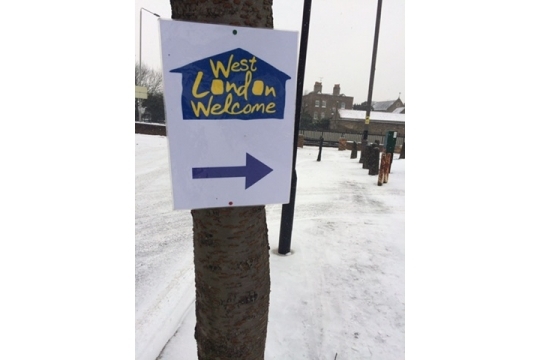 At West London Welcome, our refugee and migrant clients are usually living in destitution. From time to time, clients will suffer a particularly acute temporary financial crisis, and will ask us for support to help them. As a result, we recently set up the West London Welcome Hardship Fund, which offers one-off support when it is urgently needed. We are looking to our supporters and the public to help us raise money for this fund in order that we are able to quickly help clients in an emergency. The West London Welcome Hardship Fund provides clients with vital emergency support such as: the means to buy essentials such as food, clothes, or electricity; travel to important interviews such as at the Home Office and with lawyers; support during periods of time when subsistence payments or benefits have been temporarily stopped; support during holiday periods when most drop-in centres are closed; and ad-hoc support for clients with no recourse to public funds.